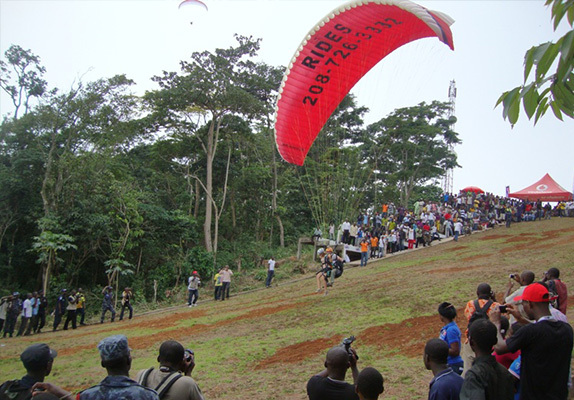 The Ghana Paragliding Festival has become an integral part of the annual Kwahu Easter Festivities. The event rekindled the hither-to dying Kwahu Easter festival and tranformed Easter celebration in Ghana into an international event. The history of the festival goes back to March 2003 when, as the new Minister of Tourism and Modernization of the capitol city Accra, Mr. Jake Tonka Obetsebi-Lamptey visited the Kwahu ridge as part of his familiarization tour of the country, and by chance crossed paths with the festival’s organizer, Walter Neser. The first Ghana Paragliding Festival, in 2005, was launched by H.E. Alhaji Aliu Mahama, Vice President of the Republic of Ghana. The festival was recristined the Kwahu Easter Festival in 2010 through the leadership of the Chief Executive of the Ghana Tourism Authority (Julius Debrah) in partnership with Adom fm (a local fm station and member of the Multimedia Group) and has thence incorporated numerous activities includeing hiking the Odweanoma mountain, walk race (walkerton), telescope viewing from the Mt. Odweanoma Observatory, Jams, Dubar of Chiefs and People of Kwahu, Music Album lunches etc. Kwahu Paragliding festival attracts both Ghanaians and foreigners alike for 4 days of spectacular aerial fun, ceremony and music. For the last 5 years, tandem paraglider pilots have gathered from around the world to fly local Ghanaian spectators and foreign visitors. The festival is open to solo pilots as well; and boasts consistent flying conditions that begin around mid morning and remain soarable until late in the day. The thermals are consistently large and mild and offer a fantastic opportunity for both newer pilots to gain valuable experience and airtime as well as for seasoned pilots who want to enjoy hours of “stress free” flying..